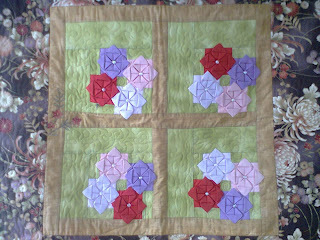 Check out this wall hanging I made with 3-D flowers. I took this class in Annapolis, Maryland, and really loved it. The pattern can be found in Rebecca Wat's book Fantastic Fabric Folding. If you enjoy adding 3-D elements to your quilted projects, this is a great book for your library. Her flowers are easy to make, and she provides step-by-step photographs to help with each one. All the projects featured in the book are gorgeous! I have added these same flowers to a table runner, which turned out beautiful (sorry, no picture! ).